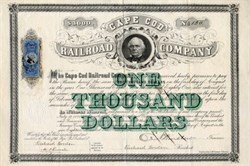 Beautifully engraved $1,000 Bond Certificate from the Cape Cod Railroad Company issued in 1871. This historic document has an ornate border around it with a vignette of Richard Borden. and has a Civil War era IRS stamp affixed to it. This item is hand signed by the Company's President (Richard Borden) and its Treasurer (E. N. Winslow) and is over 139 years old. It is also signed by Committee Members, Richard Borden and W.S. Lincoln. Colonel Richard Borden was treasurer of the Fall River Iron Works Company, and to his energy and industry the great development of the business was largely due. It was through Colonel Borden's influence that the Old Colony railroad was induced to extend its line in the direction of Fall River and Narragansett Bay, he, with his brother, Jefferson, establishing the Fall River Steamboat Company in 1847, with a capital of $3,000 to operate in connection with the railroad. Colonel Borden was interested in many other important Fall River enterprises, including the American Print Works, organized in 1834; the American Linen Company; the Troy Cotton and Woolen Manufactory, and the Richard Borden Manufacturing Company. He was also a director of the Annawan Manufactory, and the Metacomet Mill; president and director of the Fall River National Bank; director, agent and corporation clerk of the Fall River Iron Works Company; president of the Watuppa Reservoir Company; agent of the Fall River Furnace Company; director of the Fall River Gas Company, these all being Fall River corporations. He held high official position with corporations outside the city, being president of the Bay State Steamboat Company; the Providence Tool Company; the Cape Cod Railroad Company; and the Borden Mining Company, and was a director of the Old Colony Railroad Company. He was assessor; representative; State Senator, and, in 1864, presidential elector on the Republican ticket. The soldier's monument, erected at the entrance to Oak Grove Cemetery, was his gift to the city. 1854 Becomes Cape Cod Railroad reaching Yarmouthport and Hyannis. 1868 Cape Cod Railroad Company was a formed by the consolidation of the Cape Cod branch and the Cape Cod Central.